Moringa (Moringa spp.) is one of the world’s most useful plants with one of the highest nutritional contents of any plant known in the world. It is a fast-growing, drought-resistant tree that is native to the southern foothills of the Himalayas in northwestern India. It is a fast-growing tree and is grown throughout the tropics. The most widely cultivated species is Moringa Oleifera, a multipurpose tree, and usually called the Miracle tree for good reason. Common names include Moringa, drumstick tree, from the appearance of the long, slender, triangular seed pods, horseradish tree, from the taste of the roots which resembles horseradish, ben oil tree or Benzoil tree, from the oil derived from the seeds. Used for human food, livestock forage, medicine, dye, and water purification. Moringa oleifera tree has been called the tree of life in many cultures around the world, including Nigeria. It has various local names in Nigeria; its names include “Ewe Igbale” in Yoruba, “Zogelle” in Hausa and “Idagbomunonye” in Igbo. It is widely recognized for thehighly nutritious and health benefits derivable from the different parts of the plant: the leaves, seeds, and the roots.There is an increased awareness of the multiple uses of Moringa leaves for both domestic and industrial purposes leading to an increased demand for it.It is estimated that at least 300 diseases can be cured by taking this supplement along with hundreds of other health benefits, thanks to its more than 90 nutrients, 46 different antioxidants, and all eight essential amino acids. Health benefits: Here is a more in-depth look at the health benefits of Moringa leaves, stem, root, and seeds. · Scientific studies have shown that it contains specific antioxidants and health promoting ingredients that offer palliatives to malnutrition, hunger and diseases. · The young leaves are edible and are commonly cooked and eaten like spinach or used to make soups and salads. It’s rich in many vitamins, including Vitamin A, several forms of Vitamin B, Vitamin C, Vitamin D and Vitamin E.
· The oil content of de-hulled seed (kernel) is approximately 42 %. The oil is brilliant yellow. It is used as a lubricant for fine machinery such as timepieces because it has little tendency to deteriorate and become rancid and sticky. It is also useful as vegetable cooking oil. The oil is known for its capacity to absorb and retain volatile substances and is therefore valuable in the perfume industry for stabilizing scents. · Water purification: Water extract from the crushed kernels of Moringa can be used as a viable replacement coagulant for chemicals such as aluminium sulphate (alum) in sedimenting mineral particles and organics in the purification of drinking water.It can also be used as a non-toxic natural polypeptide for cleaning vegetable oil, or for sedimenting fibers in the juice and beer industries. a) Low availability of feed during the dry season, which extends from December through May. b) Lack of capacity for pasturing animals as farmers generally own small areas and these are typically not well worked or managed. · ¾ the iron of Spinach. · 20 times the Iron in Spinach. All elements except the Vitamin C is increased when you dry the leaves in the shade. Drying the leaves in direct sunlight decreases its nutritional values. Moringa trees grow easily from seeds or cuttings.It is a fast growing tree and has been found to grow to 6 – 7 m in one year in areas receiving less than 400 mm mean annual rainfall and its low demand for soil nutrients and water after being planted make its production and management easy. It can be planted using either plant cutting or seed propagation. Pruned branches gotten from mature branches are excellent for growing new trees; planting with seed are usually done directly to its intended area due to its fragile nature. 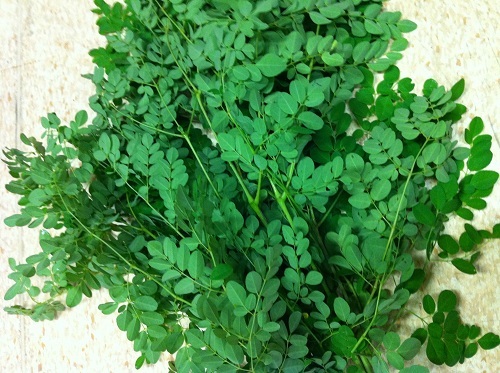 Harvesting: Moringa leaves can be harvested at any time once trees are established. Selected branches are trimmed leaving some for the next harvest or seed production. The entire tree back can also be cut to a height of about 2m during the raining season to allow recovery before the dry season. · Moringa Leaf Powder: The leaves are dried and powdered and are sold for several usages ranging from human consumption to Animal folder. Moringa dried leaves are used in cooking. They can be sprinkled on the salads to improve the nutrient value. They are also used in the cattle feed to improve the nutritional status of the cattle. · Moringa Oil: The healing properties of Moringa oil, also known as Behen oil, were documented by ancient cultures. It also has tremendous cosmetic value and is used in body and hair care as a moisturizer and skin conditioner. It finds its usage in creams, lotions, balms, scrubs, body oils, and hair care formulations. Skin moisturizing benefits are derived from the fact that Moringa seed oil is high in vitamins A and C.
· Moringa Seed cake powder: Moringa cake is ready after the extraction of Moringa oil from the seeds and it’s obtained from cold pressing method. Moringa cake is Rich in quality & 100% free from any contaminations. With 60% protein content, the seed press cake left over from crushing seeds can be used as protein supplement. Moringa Seed cake powder contains all the essential amino acid. · Moringa Tea: The exceptionally high nutritive value of the Moringa leaves has made the Moringa tea the most sought after Herbal tea worldwide. Moringa tea with the entire nutrients acts as a natural refresher. Moringa tea can be consumed by all as it contains antioxidants. · The seeds coats are removed (shelling) using shelling machine to extract the seeds. · The freshly shelled seeds are fed in to the press machine which extracts the oil.On the average 1kg of seeds (with coats) gives 120ml of cold pressed oil. · Thereafter, the oil is allowed to settle for a few days thereby allowing for sedimentation. This is very important to ensure high quality Moringa oil is produced. · The clean oil is decanted leaving behind the sediments. · The cleaned oil is bottled, and packaged for the market. Moringa looks set to become one of the fastest growing cash crops coming out of the African continent as world food prices soar and the global nutritional recession begins to take hold. The global Moringa Products market estimated to be over US$ 4 billion is highly dependent on India which supplies about 80% of the demand of Moringa products and thereby enjoying dominant position in the world. Due to a combination of its versatility, fast growth cycle, hardiness & it’s largely unrivalled nutritional and medicinal properties Moringa is rapidly becoming the favorite means by which to solve many of the food scarcity issues which have blighted many parts of Africa for many years and with the west facing the emergence of similar issues the potential for Moringa as an export is growing. Also, there is increase awareness of its amazing health usage in Orthodox medicine. It played a significant role in maintaining human health and improving the quality of human life for thousands of years and has valuable components of medicines, seasonings, beverages, cosmetics and dyes. This has significantly resulted in increase market demand for the product locally.